Even after the Velveeta maker’s shares lost more than a quarter of their value, the investors who built it from their 2013 Heinz acquisition have made almost a 50 percent profit. No such luck for Kraft’s original investors. Over three years, they have barely broken even. 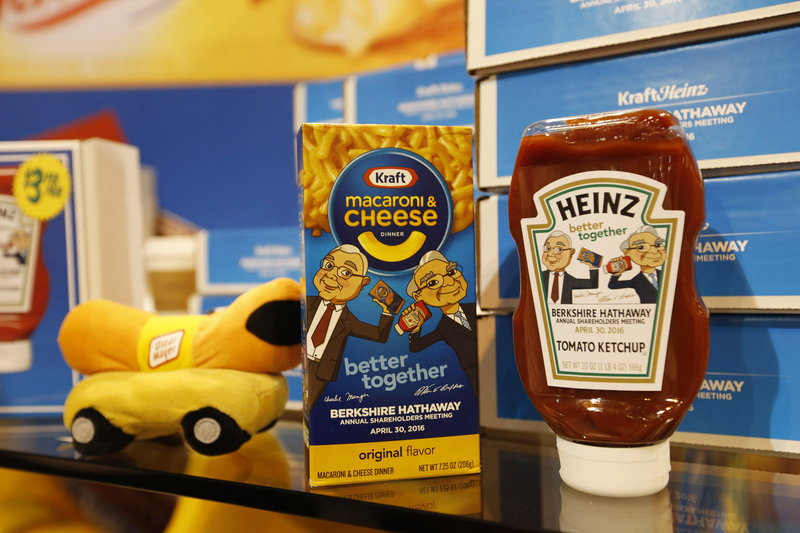 Commemorative items for sale are on display at the Kraft Heinz booth during the Berkshire Hathaway Annual Shareholders Meeting at the CenturyLink Center in Omaha, Nebraska, U.S. April 30, 2016. Kraft Heinz shares fell by more than 28 percent on Feb. 22, the day after it reported a loss of $12.6 billion for the quarter ended Dec. 29, 2018. The results were affected by a $15.4 billion non-cash impairment charge to write down goodwill and certain intangible assets, including the Kraft and Oscar Mayer trademarks. The company also recorded a $25 million increase in costs in the latest quarter after receiving a subpoena from the U.S. Securities and Exchange Commission associated with its accounting policies for procurement. Kraft Heinz is 27 percent owned by Berkshire Hathaway, the investment company of Warren Buffett, according to Eikon data. 3G Capital Management owns a further 22 percent of the stock.